What's this? Late last year, Sleek brought out a few highlighting palettes, and everyone went crazy for 'Solstice'. I tried to restrain myself but curiosity got the better of me and I ended up purchasing it! It tends to be out of stock quite a bit, so I must've just got lucky. 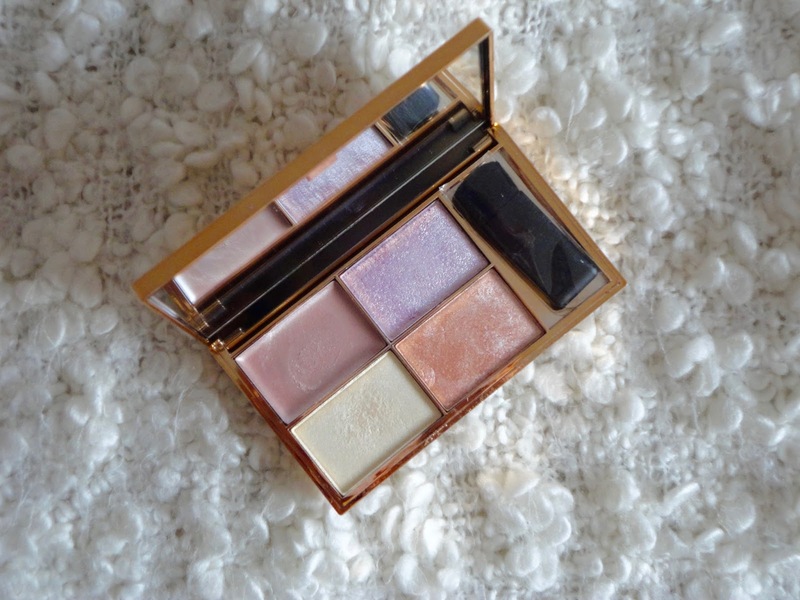 The palette comes in rose gold packaging (always a winner in my eyes!) and has a large mirror, small brush (which, as you can see, is still in the packaging since no one ever uses them!!) and four highlighting powders. There is one cream (Ecliptic) and three powders. Ecliptic is the most neutral, champagne colour, Hemisphere is a really unique purpley shade that I think would look beautiful on darker skins. 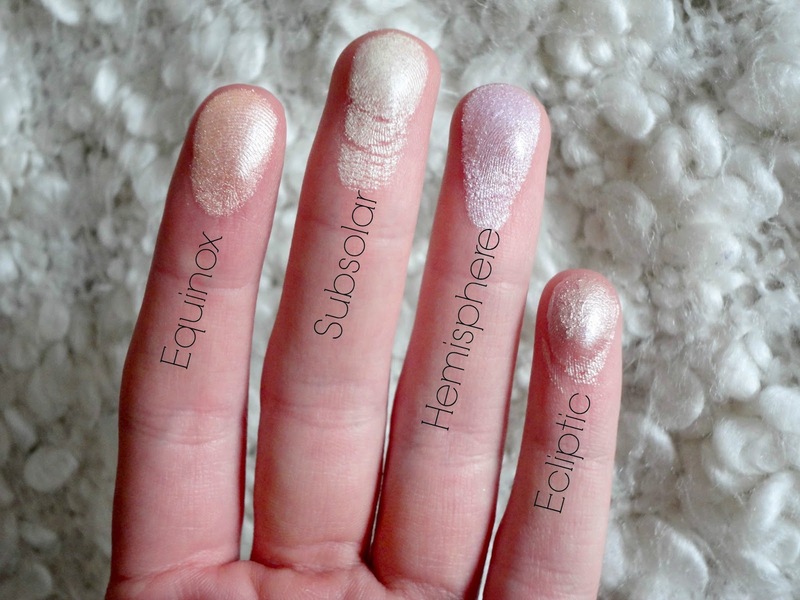 Subsolar is a yellow toned, very brightening shade, and Equinox is a orange highlighter that I think will look gorgeous with a tan in summer. Where do I get it? It's £10 on the Sleek website, and £9.99 on both Boots and Superdrug. The Pros... First of all, I love how original the shades in this palette are - there's really nothing else on the high street quite like it. Even if you're not keen on using a particular shade as a highlighter, they would all work wonderfully as eyeshadows so you'll get use out of all the shades! As you can see from the swatches, each shade is really pigmented and give lovely payoff on the skin. The scarier orange and purple shades definitely don't look so harsh on the skin as you would think either, just a very subtle hint of orange or purple that looks really lovely! I do love Subsolar as it's just so brightening and is lovely to highlight the nose and inner corner of the eye. I think the rose gold packaging is lovely too - definitely inspired by Charlotte Tilbury I think! The big mirror is great too, although it doesn't bend all the way back and is just stuck at 90 degrees, which makes it a bit useless! The Cons... Naturally, as it's a drugstore product, the lasting power of these isn't quite as great as my high end highlighters, but for £2.50 per highlighter in the palette, I can't really complain! My only other con would be that the mirror doesn't bend all the way back, which makes it a bit pointless, but that's really an issue with the packaging rather than the product itself! What do you think? Have you tried this palette - or any other Sleek products? Let me know what you think of them in the comments!